aging Which Bathroom Accessibility Aids Best Meet Your Unique Needs? Which Bathroom Accessibility Aids Best Meet Your Unique Needs? Only you know what your needs are when it comes to mobility and access around the home. Which bathroom accessibility aids best meet your unique needs? Visit a reputable and qualified mobility dealer for a thorough needs assessment to find the most practical aids and equipment for your home. Did you know that the bathroom is considered one of the most dangerous areas of the home? This is partly due to the number of slips and falls that occur annually, especially among seniors and those with physical limitations or mobility issues. There are ways to increase safety and reduce the risk of a fall in your home and bathroom, specifically, including mobility aids that increase access and independence. Take time to think about this question carefully and be realistic when evaluating your home for potential mobility upgrades. Also, take future needs into account when looking to purchase mobility aids and devices for your home environment; if your condition is chronic, you may want to invest in devices that will provide increased support over time, however, if you are recovering from an injury or short-term rehabilitation, you may not choose devices that are installed to become part of your home surroundings. A shower seat is a small way to provide a lot of security in the bathroom; these seats enable many individuals the stability to perform ADLs (activities of daily living) on their own, enjoying freedom and autonomy. There are many different shower seats to accommodate individuals with a range of physical limitations and mobility issues; talk to a qualified mobility vendor to learn more and view specific seats. Depending on the nature of your limitation or disability, you may want to consider installing a lift in your home. Free-standing lifts enable consumers that are unable to use lower extremities the ability to get up and down for ADLs, including bathing and dressing. Stair lifts make bathrooms upstairs accessible for those that have difficulty navigating steps or risers. There are many different styles of lifts to make your home more accessible, so visit a licensed dealer for a demonstration. To reduce fall risk and reduce transfers to and from the bathroom, consider the useful and versatile Shower-Buddy systems from mobility dealers in the area. These devices prevent slip hazards in bathrooms and reduce the incidence of injury to caregivers providing transfer or transport for those with a physical disability. These devices also allow consumers to maintain a sense of privacy as they complete ADLs. Prevent injury that occurs from a too-low commode; raise the toilet to make the transfer a lot easier and gentler for those with physical disabilities or limitation. Dropping to the standard toilet height can hurt; especially for someone who is thin or frail; raising the toilet can prevent fear and apprehension of using the bathroom without assistance. An inexpensive and practical option is to install grab bars around the bathroom of your home. Consider placing them near fixtures and features that get utilized regularly, including the toilet, shower, sink, vanity, and door. There are many other ways to increase and enhance the accessibility factor of your bathroom beyond these devices. Talk to a mobility expert for more insight into simple adjustments and modifications that can have a great impact on everyday convenience and autonomy. Install electric door openers for your bathroom – or other high-traffic areas of the home. Consider widening doorways and thresholds; doorways need to be at least 36” wide but not more than 48” wide to comply with the Americans with Disabilities Act of 1991. Whether your mobility issue is due to a temporary injury or a chronic health condition, ramps are an inexpensive way to boost the accessibility of your home. Talk to a contractor about adjusting the height of vanities in the bathroom. It is common to lower the height for individuals that rely on wheelchairs around their home. Think outside the box and consider your everyday routine to pinpoint the specific areas of your distinct bathroom that need modification and that will suit you best. 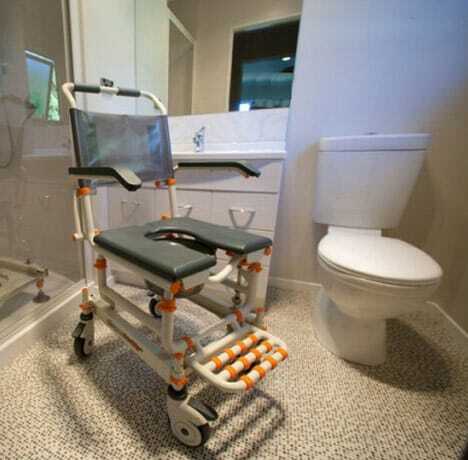 Take a good look around your bathroom and pay special attention to areas that could pose hurdles for those with mobility issues; does it pass the test? Don’t compromise your safety, convenience, and autonomy with a bathroom that presents fall risks or access issues. Invest in solutions to increase your access and autonomy around your own home. It is estimated that most falls in the home occur in the bathroom; how does your bathroom compare to those adapted for individuals with mobility issues? Talk to the experts at Pacific Mobility to find the right solutions, aids, and devices to update and enhance your current bathroom. Modifying common areas of the home, especially the bathroom, is an investment in both your home or dwelling and your own independence if you live with mobility issues or disabilities.